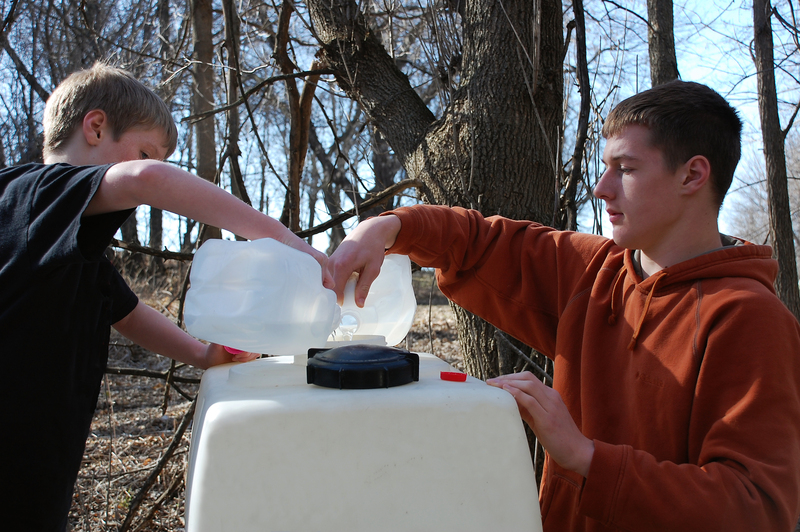 We collected sap from the trees in gallon milk jug containers and our original five gallon pails. The large pails worked well on the days where the sap was running heavily because they did not require the frequent emptying that was necessary with the gallon milk jugs. Pouring the sap into the tank from the pails was definitely more challenging, however, because of the weight and the awkwardness of the pail. The process of making maple syrup basically involves boiling the sap to evaporate water off until you reach the proper concentration of sugar. This is not a quick process! In fact, depending on the amount of sap that you have, it can take many, many hours. 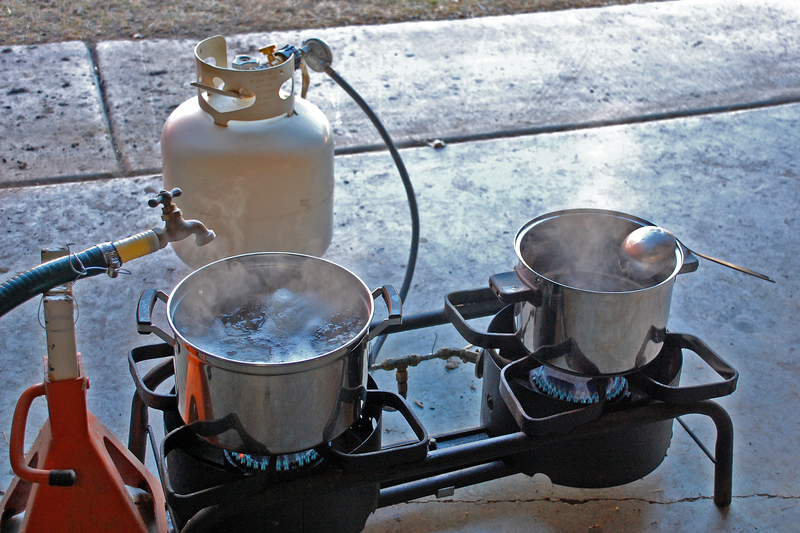 During the cooking process you cook off a lot of water, so it is best to set up outside the house to avoid all the sticky steam. Jesse set up our boiling operation in the pole-shed just inside the large sliding door. We used two of my soup pots, but have decided we need to look for something bigger for next year so that we increase the surface area for faster evaporation. After conferring with another engineer at work who was making maple syrup, Jesse decided to design a process whereby the sap could drip into the cooking pot from the holding tank at approximately the same rate the liquid was evaporating. The idea was to keep the process moving along without as much supervision. 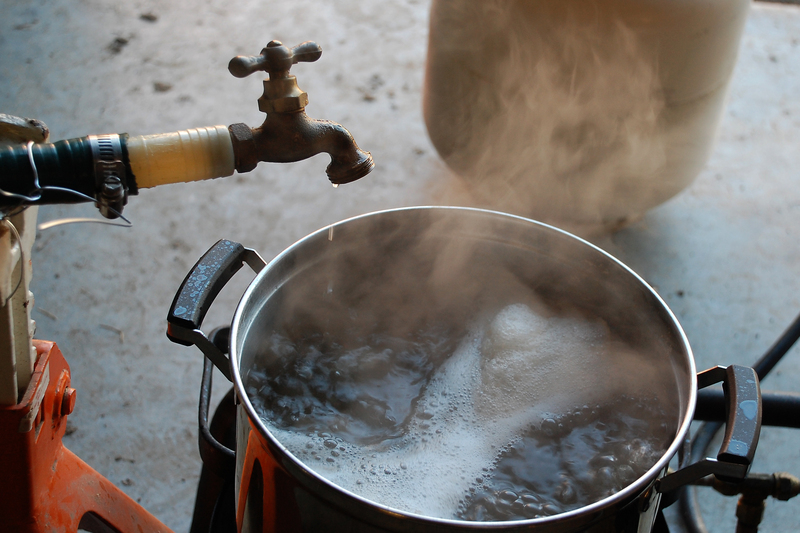 He put a faucet on the end of the hose from the holding tank and set it up to drip very slowly into the pot. Continue cooking the sap until it starts to change color and the boiling temperature starts to rise above the boiling point of water (approximately 212 degrees F). Once the sap reaches about 215 deg F it is time to bring it inside for finishing in a more controlled environment. 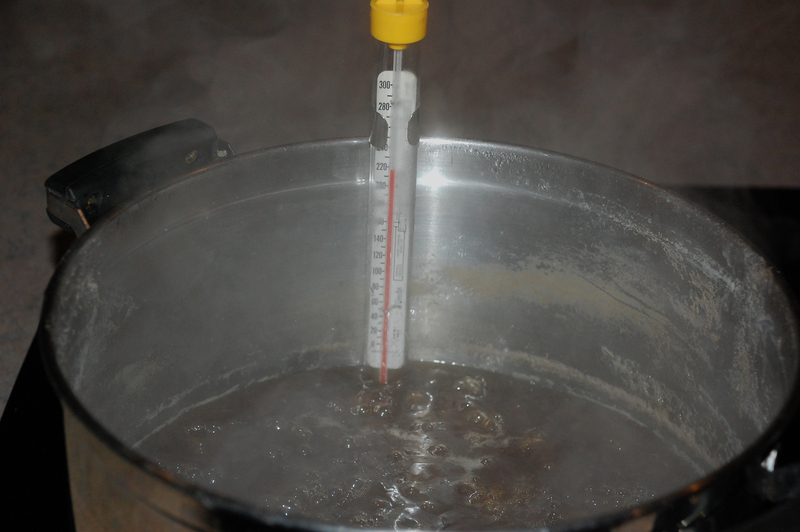 Finished syrup boils at about 7.0 to 7.5 degrees above the boiling point of water. It is important to have a good thermometer that is calibrated to at least 15 degrees above the boiling point of water (candy thermometer). As the sap approaches the boiling point, it must be monitored carefully so that it does not overheat – which can happen very quickly. Once the desired temperature is reached, the hot syrup is ready to be filtered to remove the sugar sands and other miscellaneous stuff. We found this the most frustrating part of the process because we did not have the right supplies. Most articles we read about making maple syrup recommended wool or orlon filters, but we also read that you could use coffee filters. The coffee filter only worked for about the first cup of hot syrup that we filtered and then it would plug up. Eventually we used cheesecloth to filter the syrup, but it was not an ideal method because it was not a fine enough filter. Next year we will try to find more suitable filters prior to the sap running. 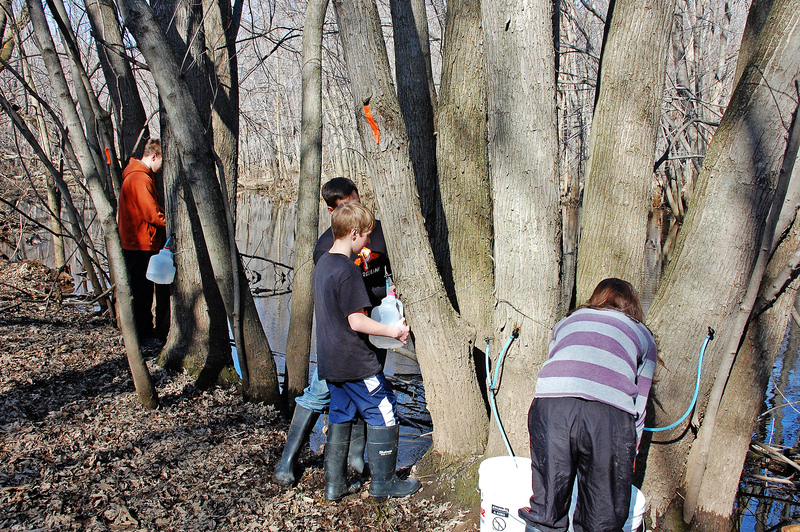 We collected a total of about 50-60 gallons of sap from our trees. 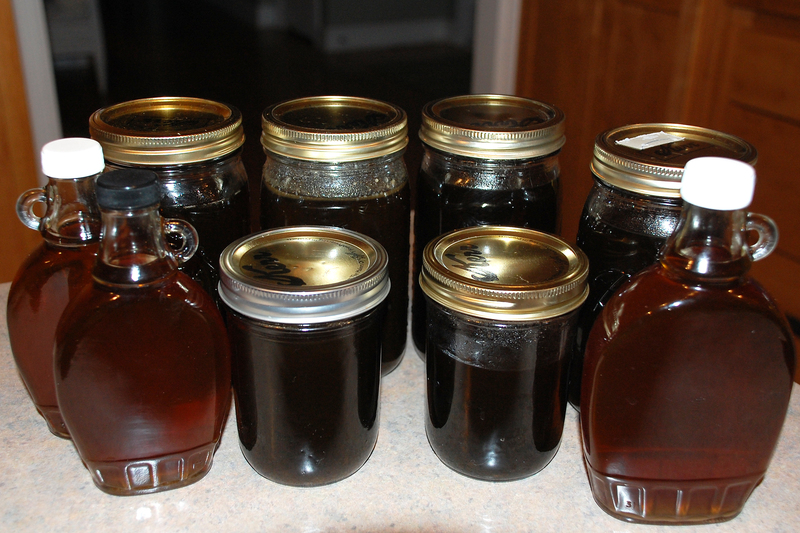 It takes a lot of sap to make any significant amount of syrup, about 40 gallons of sap to make 1 gallon of syrup! So, we ended up with about 1.5 gallons of real maple syrup after all that work. The color of the first batch we cooked is distinctively lighter, which we attribute to the shorter cooking time as this was the first small test batch that we cooked down from two full pots of sap. The following batches were cooked with the continuous flow method which increased the cooking time, but also yielded larger batches of finished syrup. And the flavor? It was fantastic! It was sweet and maple flavored like you would expect, but it also had a spicy flavor that we described as cinnamon. After all that fun and hard work, we might be a little biased in our opinions, but the kids think it just might be the best maple syrup ever. From a dollars and cents standpoint, I doubt it. For the amount of time we put into that 1.5 gallons of syrup, along with the money we spent on spiles and tubing, it probably would have been more economical to buy some syrup at a farmer’s market. It would also be much cheaper for us to buy organic eggs and honey in the grocery store too. But it isn’t always about the economics. These projects involve and engage the entire family, drawing the kids outside and away from screens. There is also something very rewarding about growing, producing and making your own food. Considering these aspects of our first adventure in making maple syrup, it was definitely worth it. As in all our new projects and adventures, we do a little research, pepper people with questions that have some experience, improvise along the way with good guesses, and create a list of things to improve on for the next time. Love your blog, & you are right, it was the smoke house blog that brought me to your site. Enjoyed viewing all the different corners of your site, including the photography, smoking recipes & building a smoker. Especially like your honest in your journaling, really helps us learn from you – thanks for the great posts! 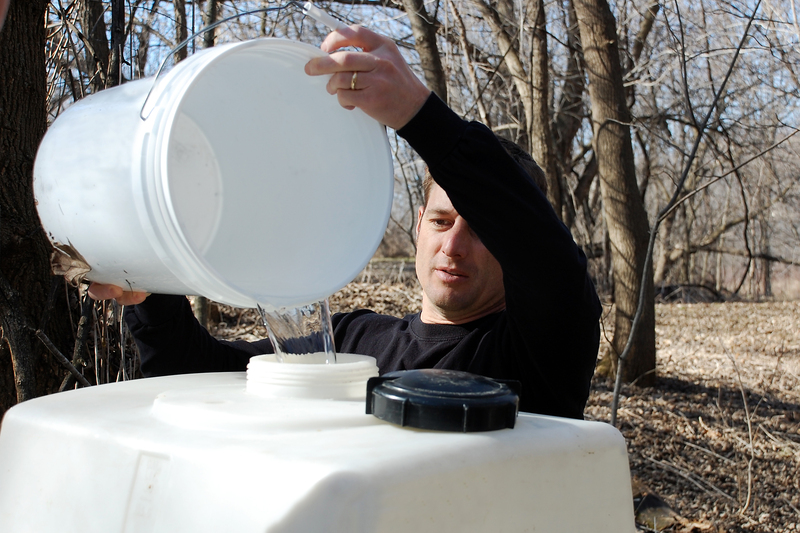 We also like the five-gallon bucket and tubing method, keeps the bugs out too. Filtering is frustrating. My wife and I use a cone-shaped felt filter and found that you have to filter a bit before the syrup is done so that it has enough water in it to go through the filter. From an economic standpoint its a bust. I’ve spent so much money this year on buckets and a giant stainless pot that I’m sure I could have bought gallons from the local supplier!